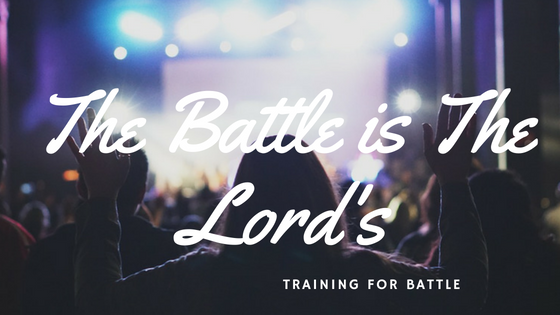 The Battle is the Lord’s – Training for War! If you are fortunate, one struggle will end before another begins. Often, however, battles invade in mass. There are times when I want to raise the white flag of surrender and say, “Enough, Lord!” Battles serve a divine purpose. Ultimately every battle we face is the Lord’s while at the same time, He is training us for war. God’s intention is for us all to become mighty in battle, warriors who are thoroughly equipped and prepared for any affront. Training is developed in the battle field of experience not in the classroom of hypothesis. We all enjoy singing the songs of victory; few relish in the throes of battle. Whatever we are going through, whether small or great, God alone gains the victory for us. Though it is tempting to “handle” the small stuff ourselves, foundational principles are learned in the little battles of life that can be applied equally to larger attacks. Don’t wait for the marriage to fail, the diagnosis of cancer, the prodigal son to run off to a distant land, or the bank account to occupy the red zone before relying on the Lord’s help. Bring every struggle and battle to the Lord, seek His strategy, and follow His directives. The King, as one in authority, went first. He set the precedent. Prayer and fasting don’t twist the arm of God, rather they position hearts to trust, eyes to see, ears to hear and minds to comprehend the agendas of God. When we learn to fearlessly trust during the “little”, trusting in the “big” comes instinctively. God dwindled Gideon’s army down to where only He would receive the glory. First God released the fearful. Fear spreads quickly! Twenty-two thousand fear-filled warriors would easily have destabilized the entire army! Once fear was weeded out, only courage remained! Fear may help get the adrenaline pumping, but no one functions at their best when afraid. It is the solid recognition of Who God is, that solidifies fearless trust. Stepping forward in God’s authority, dominion, and power, increases strength, renews hope and builds extravagant faith. Don’t be afraid of calling things out! My father would say, “Call a spade a spade!” In other words, say it like it is! State the circumstance you are facing honestly and clearly. Acknowledging personal inability to overcome a battle is never a declaration of God’s inability, only ours! “For we have no power to face this vast army that is attacking us. The important part is knowing who you are with! We’re not asking God to come and join us in our battle. We position ourselves with Him! Like a little child standing in our Father’s shadow, we are invincible with our God! We always win! Here comes the seeming contradiction! God allows the enemy to come close for the specific purpose of equipping and training us for battle. When we step into battle position, He fights! “You will not have to fight this battle. The temptation is to pick up the weapons and run ahead of our Leader. Self-reliance and self-sufficiency must be laid down before we even begin. We take our position in worship and adoration, standing firm on the unfailing promises of God. Our eyes are fixed on the LORD to bring victory. Positioning ourselves in Christ, we move forward. Face your battle! Even if you need to lean on others, stand and face your struggle! Jehoshaphat was so confident of God’s victory he placed the singers in the lead! The warriors armed with physical weapons followed behind. “What song is so powerful enemies cringe and flee at the melody?” I ask. “His love endures forever” is the answer. The song of victory buckled the knees of the enemy before the fighting began. The joyous sound of audacious faith and trust in God caused the enemy to be thrown into confusion. The minstrels carried the tune back to the streets of Jerusalem and into the temple. When the song of thanksgiving rises, demonic kingdoms hear and tremble. Why? The battle is not ours; the battle is the Lord’s.